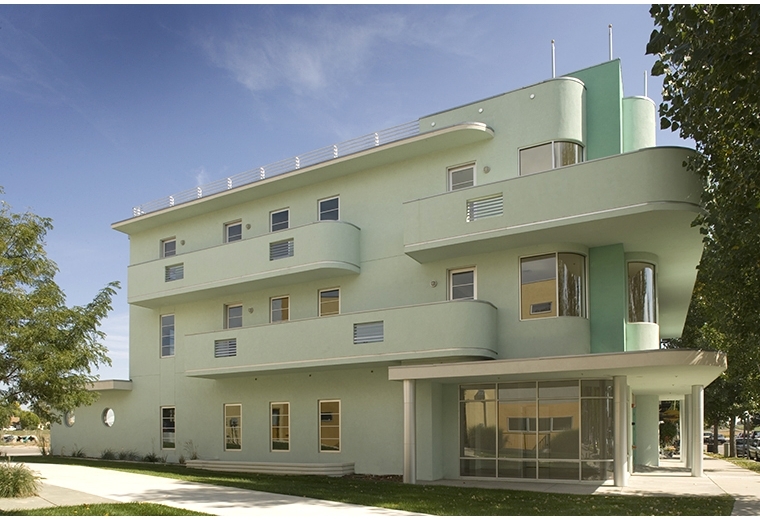 710 Tenacity Drive: The client for this art-deco style mixed-use building was inspired by Prospect’s historic pueblo-deco Johnson’s Corner service station. The project’s footprint extends to its corner lot’s setback lines at all sides, and incorporates a large interior court, visible from the street past the exterior decorative steel stair. The court is open on three sides to the building’s ground floor offices, and provides ample light and air to its four upper story apartments. Balconies serving the apartments are arrayed across the south and west elevations, focusing the facade composition on the open lot corner. Curved windows at that corner allow expansive southwestern mountain views. Design with Charles Albright Architect.